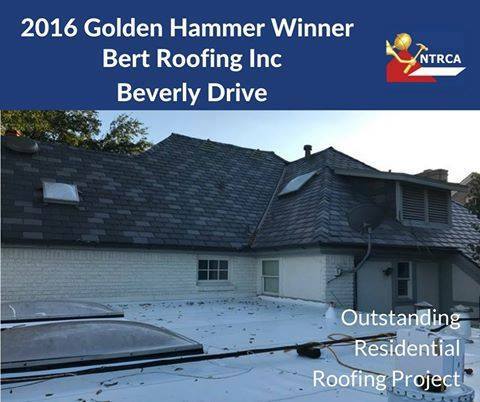 Bert Roofing named 2016 NTRCA Golden Hammer Award Winner | Bert Roofing Inc. The North Texas Roofing Contractors Association announced Dallas based Bert Roofing Inc. as a 2016 Winner of a “Golden Hammer Award” for “Outstanding Residential Project” in 2016. This is the seventh time Bert Roofing has won a Golden Hammer award for Outstanding Residential Project which is more than any other contractor. The award is given for uniqueness and/ or technical difficulty on a residential property. The Award was presented February 25, 2017, at the NTRCA annual Awards Banquet which was held at the Perot Museum near downtown Dallas. The project was a historical home in Highland Park. The gorgeous 1920’s Tudor with leaded glass windows had a 1950’s era tile that required special procedures to remove and dispose of properly. This was done with the help of Pacific Environmental and the supervision of the Building Department for the Town of Highland Park. Two vastly different roof systems were then installed on the steep sloped and low sloped areas. The homeowners decided to go with Inspire synthetic slates to blend in with the historic area of Highland Park. The Inspire product was as modern as can be with it’s Class A Fire Rating, Class 4 Impact Resistant Rating, and 110 MPH Wind Uplift Rating, but looked like it had been there forever once installed. 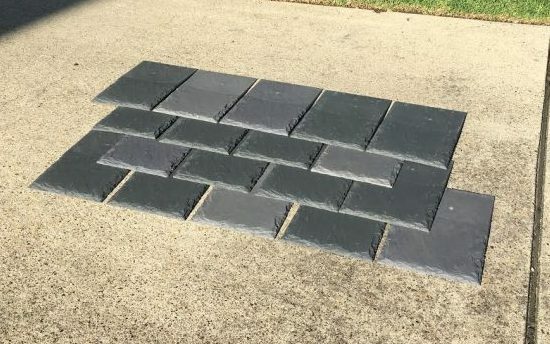 These man-made slates also come in at a fraction of the weight of real slate. Special thanks to Dave Osborn, our local Inspire manufacturer’s representative who took the time to meet with the homeowners and help them select a custom blend color perfect for their home. The blend selected was a primary color of mist grey with ash grey and granite. Like many historic homes on Beverly Drive or Swiss Avenue, there has been an addition to the original structure. The TPO system is the brilliant energy star white roof you see in the photo above. This is somewhat of a niche market for Bert Roofing as we have the experience and expertise in low slope roofing most residential contractors do not possess, but we cater to residential properties most large commercial contractors have no interest in.